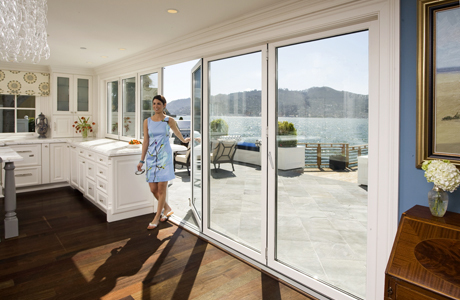 Our opening glass walls remove the visual and physical barriers and expand your sense of space in any climate. Knowing that his client wanted a classic kitchen and great room area that allowed for easy entertaining both inside and out, builder C.K. Dluzak of ZAK Enterprises in Santa Rosa, California, developed a second-to-none kitchen solution that has matched the owners’ easy, laidback California lifestyle. 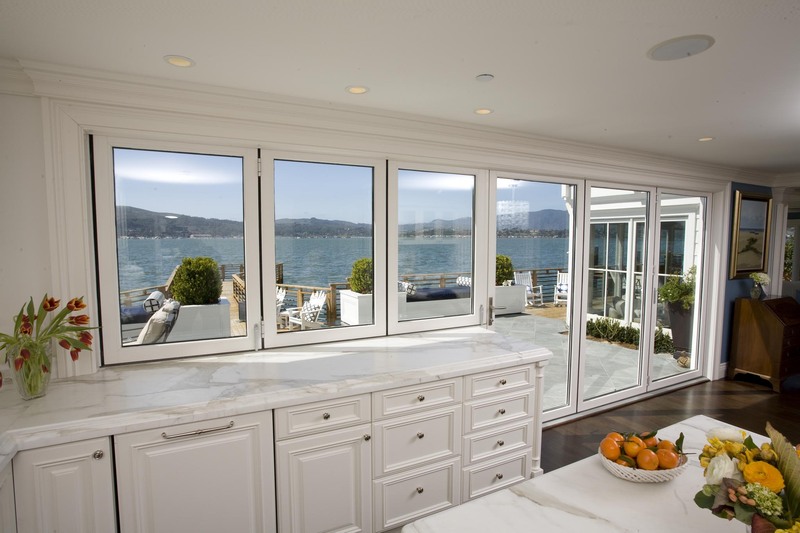 It also opens their house so that it feels like you’re out on the open waters of Belvedere Cove, not far from San Francisco. It didn’t take long for the project team to find a solution to meet their needs. 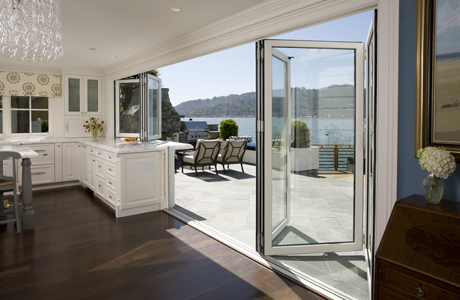 The decision was made to install a NanaWall WD66 wood framed folding window/wall combination system. 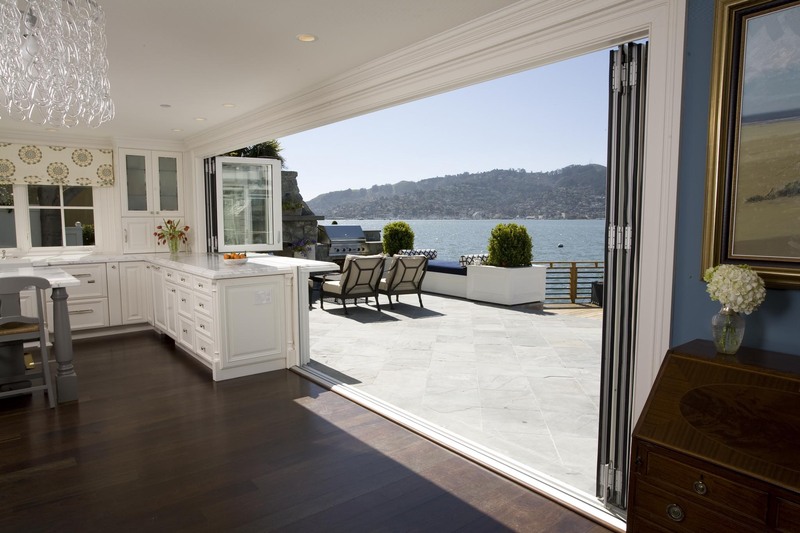 Matching a folding glass window strip with a folding glass three-panel wall opening in off-white wood finish, it give the homeowners the indoor-outdoor kitchen and entertainment area flexibility they desired. Even the stone countertops are extended outdoors with a similar material. "The window-wall combination was a great success. The dimension and parameters were exact. They're extremely waterproof, too." 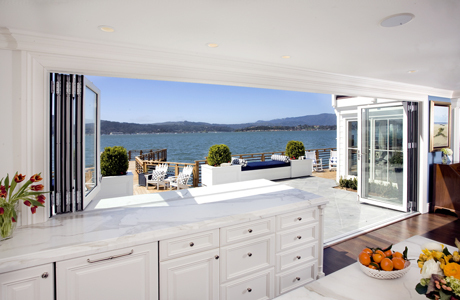 Open views to their stunning waterfront property and fresh air to circulate through the kitchen and great room area were also considerations. It was a combination of the design flexibility and performance attributes that made the Belvedere Kitchen project a home run for the builder and, ultimately, the homeowners. 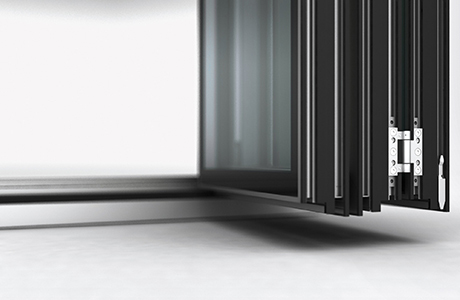 The six panel top-hung WD66 combination window/wall is inward opening and gives the homeowners maximum flexibility. The three-grained, solid wood panels have a frame thickness of 2-5/8 inches, making for a beautiful, sleek and lightweight window and wall that’s easy to maneuver. 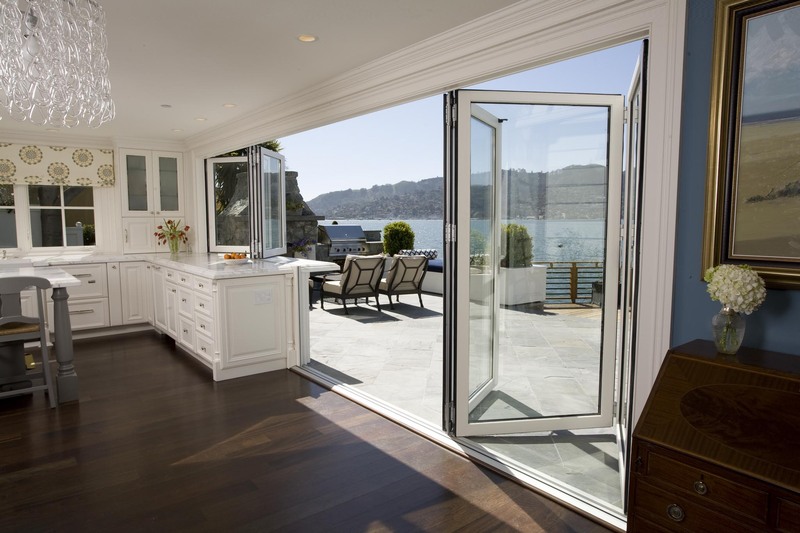 That speeds the transition, allowing the homeowners the ability to quickly and effortlessly go from an open air, indoor-outdoor situation to a completely airtight and waterproof kitchen in a matter of minutes. A load-bearing, upper-running carriage and a lower-running guide carriage is attached between the panels to ensure even distribution of pressure on all rollers. The glass walls and windows also allow for plenty of daylight to spill into the home, and evidence-based design (EBD) studies show that daylight is vital to people’s health and well-being. At the same time, the residents are offered open, airy views – which certainly boost the morale. The less obvious but no less highly integral components of the WD66 system include the head jamb, frames, pins and screws, hinges and locks, which are all thoughtfully designed. The head jamb is aluminum with matching wood fascia pieces on both sides while all frames, sills and sealers are provided in a clear or anodized finish for maximum aesthetic compatibility. Similar to the kitchen appliances, it’s good engineering that is also largely invisible. As C.K. 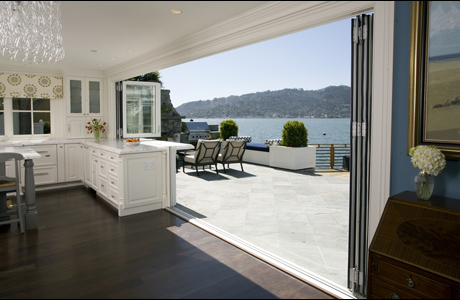 noted, the local winds and rains can be strong, but the NanaWall’s WD66 is ready, with weather stripping of EPDM or brush seals for between panels and between panels and frames, allows for maximum energy efficiency and occupant comfort at the Belvedere Kitchen.